Work has started on refurbishing the museum at a historic mining site in west Cornwall. The £3m project will see Geevor Tin Mine, which ceased working in 1992, restored to its former glory. The buildings that make up the museum are being refurbished with many of the same materials and building techniques originally used 200 years ago. When the work at the museum is complete it will be able to display many more of Cornwall's mining artefacts. 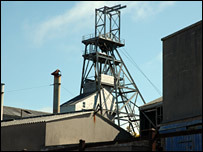 After the mine ceased working, the county council bought the site and opened it to the public.